Match Real Madrid-Bayern Munich Champions League the fixture is set to kick-off today 18:45 on Estadio Santiago Bernabeu. Refereee Viktor Kassai. Real Madrid takes place, which promoted to the European cups. In 5 last matches (league + cup) team gain 0 points. The best players Real Madrid in Champions League , who scored the most goals for the club: Karim Benzema 5 goals, Cristiano Ronaldo 4 goals, Alvaro Morata 3 goals. Players with the most assists: Karim Benzema 1 assists, Cristiano Ronaldo 6 assists, Alvaro Morata 1 assists. Injured players Real Madrid: Pepe, Raphael Varane, Gareth Bale. Bayern Munich takes place, which promoted to the European cups. In 5 last games (league + cup) Bayern Munich get 0 points. Leading players Bayern Munich in Champions League is: Robert Lewandowski 7 goals, Arjen Robben 3 goals, Arturo Vidal 3 goals. Most assists in the club have: Robert Lewandowski 1 assists, Arjen Robben 1 assists. Direct matches: Real Madrid won more direct matches. 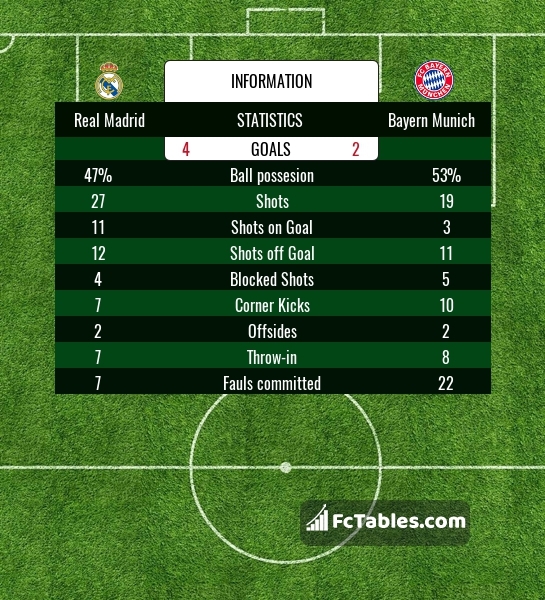 Real Madrid won 8 matches , Bayern Munich won 6 direct matches, was a 2 draws. In 8 matches the sum of the goals both teams was greater than 2.5 (Over 2.5), and 10 matches teams scored more than 1.5 goals (Over 1.5). In 8 matches the both teams scored a least one goal (Both teams to score).